Click on the photo for a larger version, and then you will be able to see the tiny stripe detail of the chair’s upholstery. Something old, something new, something borrowed, and something blue. The chair once belonged to a great aunt. Ever since I have been out on my own, this chair has moved with me from apartment to apartment then to my house. It’s one of the few hand-me-down relics that I have retained. In fact all three pieces of family furniture I chose to keep once belonged to this great aunt. And when I can find and purchase a wonderful reading lamp, this chair next to the fireplace will become my reading nook during the cold winter months. I love the smell and crackle of a wood burning fireplace. I usually purchase aged oak to burn, but I will occasionally splurge and purchase Irish Turf and/or peat briquettes. I spent three incredible weeks in Ireland back in 2000, fell in love with the smell of the burning Irish peat, and am always wanting to relive those memories with its scent. Beautiful, Patsy Ann. 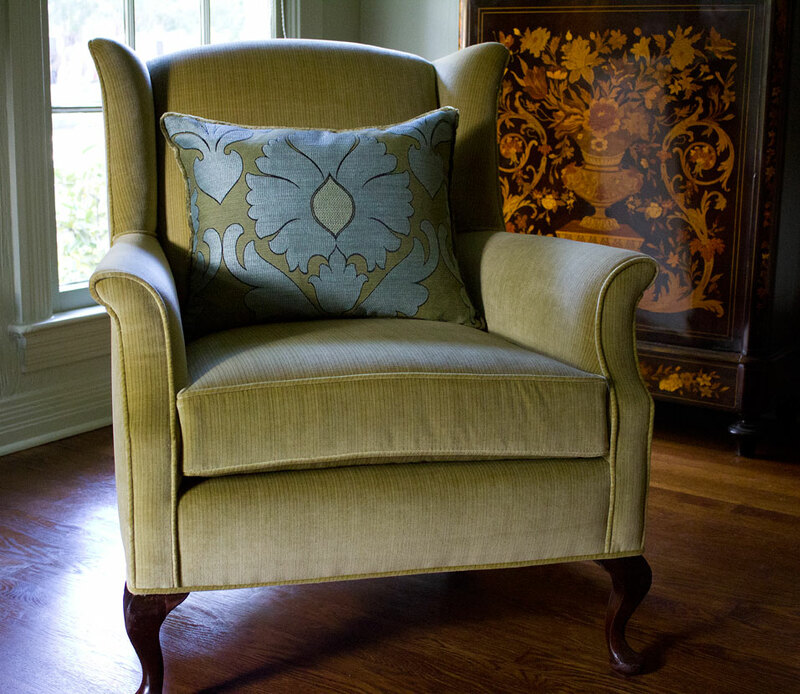 The proportions and curves of the chair are marvelous, as is the elegance of the fabric. Is that a firescreen or a chest behind and to the right? (Hard for me to tell.) I understand you love of an Irish fire. I’ve as yet to meet anything Irish I didn’t like. What a wonderful country. I’ve been fortunate to spend time in Dublin and Cork, where I did one of the few truly touristy things I’ve ever done: hug upsdie down to kiss the Blarney Stone. Margaret, what you see behind to the right is a Napolean III rosewood marquetry cabinet. As soon as I rehang/recenter the art piece that’s above it, I’ll photograph it for my peekaboo series. You’re a very gutsy girl to kiss the Blarney Stone. I went to the tower and climbed all the way to the top just to see how a tower keep is laid out with all its little rooms tucked off into the side of the spiral stair walls. Once I got to the top, I enjoyed the views, but didn’t feel the need for any additional Blarney. You see, I’m half Irish and naturally full of the gift of gab.